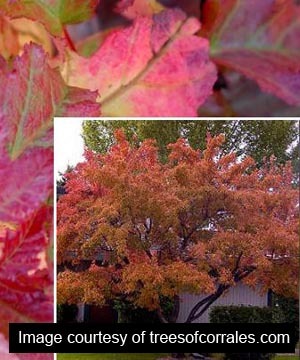 Foliage: 3-lobed leaves turn yellow to deep red in fall. Water: Adaptable watering, but prefers medium. Is drought tolerant in partial shade. Sun: Sun. But also grows in part shade/part sun. Comments: Can take heavy pruning, makes a good screen if thickly planted. Works under power lines. Warnings: Sapsuckers, leaf spot, heavy seeder, needs pruning to develop into a single-stemmed tree. Street Tree? yes Street Tree Conditions: Suitable if pruned to single stem. Known Locations: Nice specimen on Shadow Wood Dr. near Wildwood Place. Marilyn Loser west yard (multi trunk).